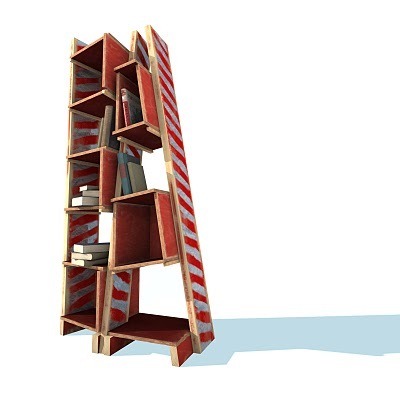 It’s not an oddly painted bookshelf made of scrap lumber. It’s not. 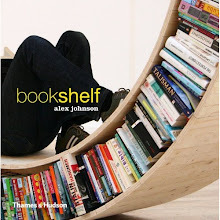 I feel I should point out -- because I am receiving some inquiries about this piece, and people seem to have discovered it here -- that this "not a bookshelf" piece is not a bookshelf because it isn't. It isn't real, yet. As explained on our website, you are looking a computer rendering of a digital model. It's a test of a piece of modeling software (we do architecture and design), with the idea that if decent dimensions can be extracted from the model, we'll use them to make this thing to hold our extra architecture books from some salvaged lumber we happen to have. We have experience with carpentry, furniture making, and painting (we are architects, after all), so chances are the real piece will look a lot like this computer rendering. But this real version won't exist until we have some time to build it.